As of this moment of writing this newsletter, I am in day seven of no electrical power, limited gasoline, and minimum patience. (I’m one of the lucky one as I’m using a generator fueled by gas siphoned off from The Foto Boat!) Hopefully this situation will alleviate itself in the near future. I apologize for not responding to many of your e-mails. As it is, I’m not sure when this newsletter will reach you. I was able to have a quick review of most of my Galapagos images before Wilma did her deeds, and will put them in the Galapagos Gallery on my website. I hope a few will be able to make it into the Titusville slide presentation “You’re Strictly For The Birds”, but all this is dependent on Florida Power and Light! This collection of little volcanic islands located on the Pacific side of South America near the equator is an amazing natural laboratory for the study of evolution as well as a fenceless, gateless zoo! Although, in comparison to many other areas of the world, there are only a few species of various critters residing on these islands, all were usually easily seen ‘up close and personal’ at some point in my visit. I have long admired (and envied) the life and works of world- renowned photographer, Tui De Roy, who was raised in this fascinating, yet mysterious, environment. 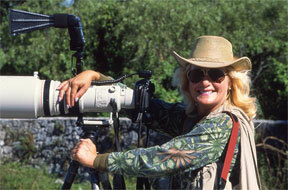 Through her joy of nature & camera lens, she has taken some of the best images of the Galapagos the world will ever see. A highlight of my trip to the Galapagos was to be invited to her family’s home and spend a wonderful morning with her energetic mother, Jacqueline De Roy, and the (famous) finches that flock to her patio, as well as the yellow warblers, & mocking birds. Mrs. De Roy eagerly shared the scrapbooks of her children’s childhood adventures, as well as her vast and interesting collection of the islands’ artifacts, plus the beautiful hand-made jewelry she creates. I recommend Tui’s beautiful & informative book, “Galapagos, Islands of Fire”. I believe her new book has just been released also. Despite the fact that most of the wildlife on the Galapagos Islands can be viewed from a few feet away, photographing them can be quite difficult and frustrating. Due to strict national park regulations (which I applaud for the most part), time restraints are limiting. Flashes are not allowed. Often the light is too harsh, or not behind you, causing unwanted shadows, and/or hot spots. The terrain is either very glary beaches or dark lava rock. Subjects are either very snowy white birds, such as the waved albatross & red-billed tropicbird, or very dark such as iguanas, lava lizards, sea lions as well as many of the birds. The yellow warbler, vermilion flycatcher and brilliantly-painted Sally Lightfoot crab are the exception and welcome splashes of color. Understanding your camera’s functions and mastering ‘compensation’ will help to overcome lighting obstacles. This is the first trip I have ever taken when film was totally absent from my camera gear!! (I can hear some of you chuckling right now!!). The histogram is an incredibly valuable tool. For those digital SLR users knowing how to use Adobe Photoshop will also be a huge help. For me, lugging the tripod and heavy equipment over rocky, unsteady paths proved to be a huge challenge and eventually the tripod was retired to my cabin. Ninety-five percent of my images were shot with my Canon EF 70-200mm f2.8 IS zoom lens and the 16-35 mm wide angle, hand-held. Every day, landings are made via zodiac (rubber rafts), and great care must be taken with the camera gear---another challenge, especially during “wet landings” onto slippery rocks and beaches. Even though photographing in the Galapagos is difficult, the experience more than makes up for any challenge or disappointment one might have over a poorly exposed image. All my “shipmates” were a pleasure to be with, and I feel some long-time friends were made. 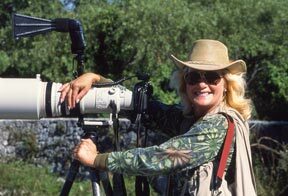 I’ve checked with the “powers-that-be” regarding a future Joanne Williams Photo Safari to the Galapagos. I’m told that with proper planning and the right contacts and licensing, arrangements can be made to alleviate some of the obstacles photographers run into. We’ll see…..Do let me know if you are in anyway interested. Visit their website for on-line sign-up: www.nbbd.com/fly/ If you are planning to attend the festival and are interested in my Panama Photo Safari, try not to miss Carlos Bethancourt’s presentation “The Best Birding Spots of Central Panama.” Carlos is one of the top birding guides in all of Panama. I’m sure his presentation will reinforce my enthusiasm (and yours) about my upcoming Panamanian Photo Safari. (Visit my website for details about my tour to that beautiful country and other events: www.joannewilliamsphoto.com). Carlos will be speaking Nov. 16 & 17th from 1:00-2:00 at the BCC gym room 153, and Nov. 20th 11:30-12:30 in room 119. Also, come and visit my booth and pick up tour brochures. As stated in previous newsletters, I am going to make time for 4 (four) 15-minute, private, reviews (critiquing) of your images at no charge. Bring prints, slides, and/or your laptop. This has to be by appointment only on a ‘first-come-first-serve’ basis. There will be a sign up sheet at my booth. If time permits, I’ll do more.